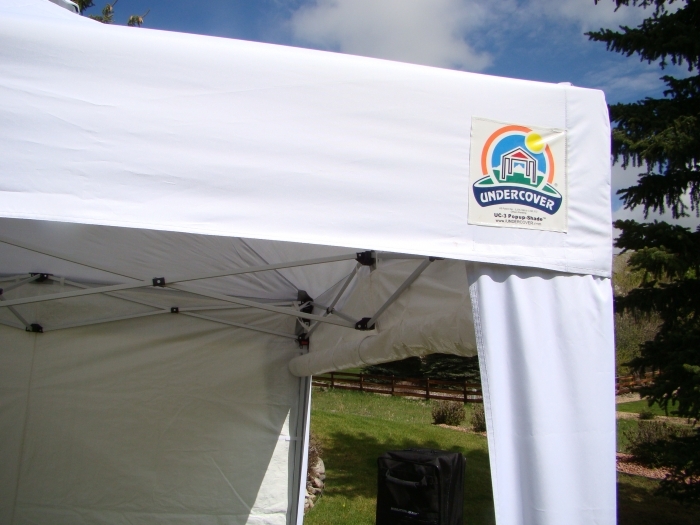 If you have a small gathering of folks coming over and would like to meet out doors, then the Undercover Professional-Grade Aluminum Popup Shade Package with White Top is just the item that you need to make sure that you have a wonderful time with everyone present. 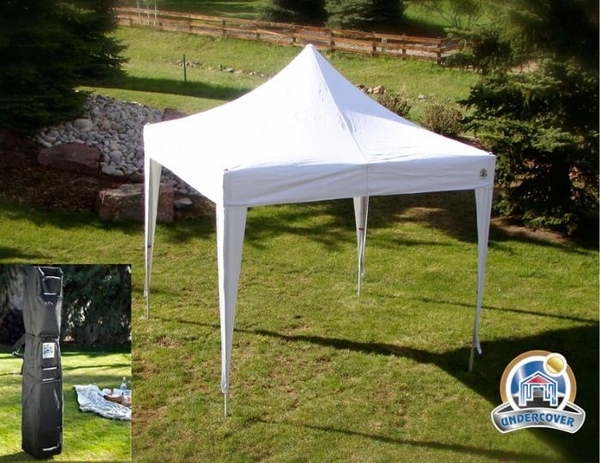 Not only can it be easily assembled by one person but also you will find that the fabric of the tent blocks almost all of the UV rays so that no matter how long you stay outdoors, you will not show any signs of it. Can you get the top in different colors? Unfortunately we only supply this unit in white at this time. Is this tent sturdy enough to be used at craft fairs, on sidewalk pavement? How well will it handle rain? This is indeed a very sturdy product. It can stand on its own on the sidewalk. However, please keep in mind that pop-up canopies are not made for rain and wind and are never warrantied against it. If possible, you should weight down each leg with something to keep if from flying away if the weather gets out of hand. Very nice and worth the extra money. I haven't taken it to the farmer's markets yet, but it has been set up in the front yard. It provides great shade and it's nice looking. It has a quality feel to it and I like the idea of the vent on top, as one of my venues is HOT. I've seen some cheapo canopies and have owned a higher end one. This is a nice middle ground and I'd recommend it. I don't give it five stars because I haven't tested it in our winds, yet. This was a big decision for me and I spent a lot of time on line researching not only price but differences in frames, fabric canopy weight, uv protection, max height, warranty , and accessories available . I chose this one because of the heavier fabric top, the interior coating which reduces the temperature under the canopy, and strength of the aluminum frame. I feel I is truly a commercial grade canopy. I also added to my order, the curtain style sides, and the gravity bags which I can fill with water. We did a trial run setting it up in our back yard so the morning of the show it was a snap to set up. I am mainly using my canopy in SW Arizona, so we have a lot of severely bright days and many unexpected powerful winds. Also, I find the exterior peak very stylish compared to other brands. I have no second thoughts about my choice. This is a good company with a good product. My use of a canopy is primarily for weekend sporting events and family get-togethers. Thus, after enduring a "bargain" canopy, which looked great in in the store and then self-destructed in the Real World, I now value a canopy that "just works" and doesn't become its own weekend project. We've now had our Undercover canopy for a little over a year--and it delivers! On two recent beach trips, we quickly popped up our canopy, anchored it, and enjoyed no-hassle shade. I took no small amount of pride in watching our canopy remain King Kong stable while other canopies were manhandled in the wind. The canopy and bag it comes in are well thought out, soundly built, and are easy to use. Even the instructions are well-written. The canopy fabric is impressive. But, the frame is an amazing work in aluminum. 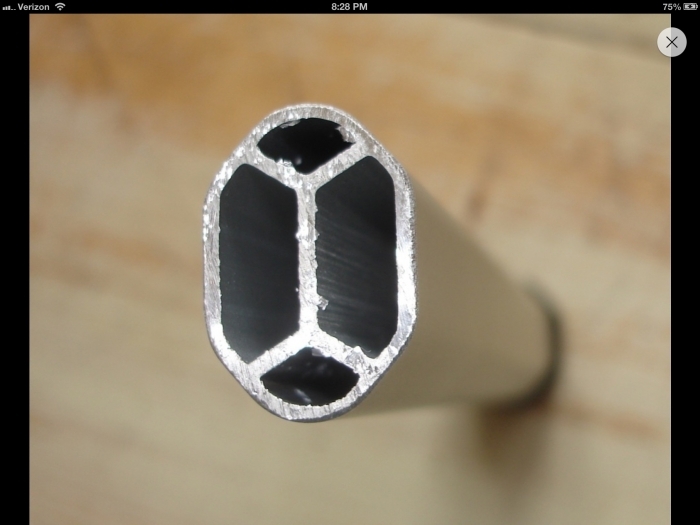 A primary, unseen feature is the internal, Chan-X reinforced aluminum beams, which allow the frame to be very rigid. The solid construction does result in a fairly heavy package (55 lbs. in bag). But, the well-designed roller bag helps make moving the canopy an easy task. The bag also has sturdy handles (in the right places) and backpack straps. Like the leg covers, our backpack straps are in no danger of actually being used (But, they could serve to dress up the canopy). While cleaning up after the last beach trip, I noticed a possible issue with a button/lever on one of the corner sliders (mind you, it still worked...but, looked like it eventually could become a problem). So, I e-mailed Undercover. With neither hassle nor delay, Undercover's support team cheerfully sent a replacement part. Undercover's excellent service and communication further confirms that Undercover is an excellent product from people who are passionate about providing quality shade. Something a little unexpected: Because of its great walk-under height, the stowed canopy is longer than others you may have seen. At about 5'3" long (63" X 10" X 10" across), you won't be putting this bad boy inside a Mini (or probably most trunks). But, the length is easily accommodated in "family" vehicles, trucks, well-designed cars, or on roof racks. The frame is heavy duty. The canvas material is excellent and the tent looks better in person. Best canopy we've owned. Extremely rugged, and great looking. Example of the high quality - we were exhibiting at a large outdoor craft show, and an unexpected weather front moved through the location during the night along with a very high wind gust. Bottom line - of the 18 other brand canopies destroyed - our Undercover canopy only received minor truss damage allowing us to continue to use the canopy that next day. Contacting Undercover's customer service the following week to get replacement parts was easily resolved, and we had the parts in two days! I highly recommend this canopy if you are an active craft- or farmers-market vendor. Easy set-up and built to withstand continued heavy usage. This is one sturdy canopy. The top was put on in seconds and put up and taken down in minutes. Top is quality material. You cant go wrong with this. Looking Sharp in the Crowd of White!! Artists at outdoor events, this is the end of your search! Everything mentioned in other reviews & more! I researched til I knew everything about all the competitors & still this canopy delivers more then expected.Other reviews are spot on. *Corners of canopy are double fabric. *Vented top with soft screen inserts, velcro to close. These pop-up tents are so far above the norm. We set two up on the beach each morning for a week. Several folks came by to ask where we got them. They are obviously better constructed than most others. I actually set the tents up by myself. It took about 10 minutes each tent. They are heavier than other tents but nothing a normal adult can't handle. The peak is higher than others and sheds water so much better that we had no "ponding" of water in the flash showers that typically occur along the Gulf Coast. ProsStability, ease of set-up, vented top, height options from 6' to 7' feet at eves, top stretching device to keep sag out of top. ConsHeavy but then that is what gives it the stability that is so important to this type of tent. This is definitely a bit better built then your typical canopy. The struts are a bit wider, the hardware a little nicer, the quick releases are designed not to pinch you. The top cover has vents and is more of a fabric then a vinyl. It was easy to setup and looked good. It will be our primary 10 x 10 canopy now. Our older Caravan is still fine but this ones just better in all ways. I did a lot of research before making this purchase. The price was good for the quality and I liked the leg covers. I got it today, put it up, and was thrilled with the quality of the materials. It's very elegant and obviously well constructed. The tent took me about 15 minutes to figure out how to put up. It'll be faster in the future. It took about the same time to get down (also, faster with practice) I was being very cautious. I purchased the weight bags as well because I have seen art fair tents fly and they can be very dangerous. I highly recommend buying the weights too! "I used several other "EZ" instant shelters in the past for my DJ equipment and they always seemed to be built with poor quality. I got tired of replacing parts and dealing with stuff so I decided to spend a little more money for higher quality this time around. I received this tent and was very impressed the first time around! This thing is a bit heavy but it seems to be very durable and well designed unlike my past shelters. I needed a reliable and solid instant shelter to protect my DJ equipment in the HOT Florida heat and rain - this shelter does the job! The frame on this is very heavy duty. This is not a lightweight piece of equipment. I am very pleased with the quality of the product. I opened the packaging to a big sign that said Ã¢â‚¬Å“STOP Ã¢â‚¬â€œ read the instructionsÃ¢â‚¬. The instructions are easy to follow and set up for the first time was a breeze. I would suggest having two people set up the first time as it requires attaching the canopy fabric to the frame. Once this is done, the canopy can be set up or taken down by one person very easily. There are no instructions regarding the Dial-A-Fit feature to take the slack out. This was figured out by trial and error. The Wheel Spin bag included seems lightweight considering the weight of the product, 50+ pounds. IÃ¢â‚¬â"¢m not sure this will hold up. WeÃ¢â‚¬â"¢ll see. On other models from this company this has been a common theme of complaint regarding the lesser priced canopies. Time will tell. Overall, I would say this is a very well engineered product and I am happy with the purchase." I just wanted to write and let you know that this is a great product. Last year I bought your UC-3 10'x10' tent and I thought it was the best pop-up tent in it's category. The quality was great, very durable, and easiest to use and set-up. Even the roller bag was of high quality. Then, on April 1st I appreciated your product even more. After finishing cooking out on my deck, my propane grill had a leak and caught fire. The fire quickly consumed my grill and deck area and I was forced to leave the house and call 911. Behind the grill area, my UC-3 tent was set up to block the sun while I was grilling on this 86 degree day. Well, when the grill caught fire and had a small explosion, the flames began to engulf the tent. Had your tent not been made of fire retardant material, it would surely have caught on fire and spread the fire to my house and roof. Luckily it was not, and the tent only burned and melted, but did not spread the fire. You make an outstanding product and I wanted you to know that I am very satisfied. Even though my original tent is preparing to make a trip to the local aluminum recycle shop, I was so impressed with it that I just purchased another. My budget does not allow me to get an additional tent right now, but one day I will get the 10'x20' version and have my backyard parties covered. All other products in this category are inferior; do not change a thing and keep the quality and price point the same and you will have a customer for life.